The Saint Petersburg, Russia, paper mill of Goznak opened in 1818. It used hemp as its main input material. Paper from the mill was used in the printing of "bank notes, stamped paper, credit bills, postal stamps, bonds, stocks, and other watermarked paper." In 1916, U.S. Department of Agriculture chief scientists Lyster Hoxie Dewey and Jason L. Merrill created paper made from hemp pulp and concluded that paper from hemp hurds was "favorable in comparison with those used with pulp wood." The chemical composition of hemp hurds is similar to that of wood, making hemp a good choice as a raw material for manufacturing paper. Modern research has not confirmed the positive finding about hemp hurds from 1916. A later book about hemp and other fibers by the same L.H. Dewey(1943) have no words about hemp as a raw material for production of paper. Dried hemp has about 57% cellulose (the principal ingredient in paper), compared to about 40-50% in wood. Hemp also has the advantage of a lower lignin content: hemp contains only 5-24% lignin against the 20-35% found in wood. This lignin must be removed chemically and wood requires more use of chemicals in the process. The actual production of hemp fiber in the U.S continued to decline until 1933 to around 500 tons/year. Between 1934 and 1935, the cultivation of hemp began to increase, but still at a very low level and with no significant increase of paper from hemp. Currently there is a small niche market for hemp pulp, for example as cigarette paper. Hemp fiber is mixed with fiber from other sources than hemp. In 1994 there was no significant production of 100% true hemp paper. World hemp pulp production was believed to be around 120,000 tons per year in 1991 which was about 0.05% of the world's annual pulp production volume. The total world production of hemp fiber had in 2003 declined to about 60,000 from 80,000 tons. This can be compared to a typical pulp mill for wood fiber, which is never smaller than 250,000 tons per annum. The cost of hemp pulp is approximately six times that of wood pulp, mostly because of the small size and outdated equipment of the few hemp processing plants in the Western world, and because hemp is harvested once a year (during August) and needs to be stored to feed the mill the whole year through. This storage requires a lot of (mostly manual) handling of the bulky stalk bundles. Another issue is that the entire hemp plant cannot be economically prepared for paper production. While the wood products industry uses nearly 100% of the fiber from harvested trees, only about 25% of the dried hemp stem—the bark, called bast—contains the long, strong fibers desirable for paper production. All this accounts for a high raw material cost. Hemp pulp is bleached with hydrogen peroxide, a process today also commonly used for wood pulp. 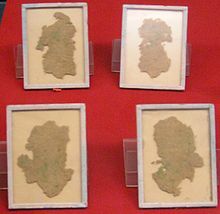 ^ "Cai Lun Improved the Papermaking Technology". chinaculture.org. ^ "The Project Gutenberg eBook of Hemp Hurds as Paper-Making Material, by Lyster H. Dewey and Jason L. Merrill". Gutenberg.org. Retrieved 2011-04-20. ^ Stevulova, Nadezda (December 2014). "Properties Characterization of Chemically Modified Hemp Hurds". Materials. 7: 8131–8150. doi:10.3390/ma7128131. ^ Dewey LH (1943). "Fiber production in the western hemisphere". United States Printing Office, Washington. p. 67. Retrieved 25 February 2015. ^ "Papper". Hampa.net. Retrieved 2013-11-09. ^ "David P. West: Fiber Wars: The Extinction of Kentucky Hemp". Gametec.com. Retrieved 2011-04-20. ^ "Additional Statement of H.J. Anslinger, Commissioner of Narcotics". Retrieved 2006-03-25. ^ a b "Michael Karus:European hemp industry 2001 till 2004: Cultivation, raw materials, products and trends, 2005" (PDF). Retrieved 2011-04-20. ^ a b "Steam energy:Hemp Pulp & Paper Production, January 1st 1994". Hempline.com. Retrieved 2011-04-20. ^ a b Van Roekel; Gerjan J. (1994). "Hemp Pulp and Paper Production". Journal of the International Hemp Association. Wageningen, The Netherlands. ^ "Anatomy of a Modern Paper Mill, Faculty of Natural Resources Management, Lakehead University". Borealforest.org. Retrieved 2013-11-09. ^ "Boise: Nonwood Alternatives to Wood Fiber in Paper". bc.com. 2007-07-08. Archived from the original on July 8, 2007. Retrieved 2013-11-09. This page was last edited on 9 March 2019, at 16:50 (UTC).